Dr. Tsou is a nationally known consultant on public health and health care reform. Currently, he is on the visiting faculty of the University of Pennsylvania. He was President of the American Public Health Association in 2005. He served as Health Commissioner of Philadelphia from April 2000 to February 2002. Prior to his appointment, he was the founding Deputy Director for Personal Health Services and Medical Director of the Montgomery County (PA) Health Department from 1991-2000. Before 1991, he was the Clinical Director in the Division of Ambulatory Health Services for the Philadelphia Department of Public Health. He has extensive experience in public health and has lectured widely on public health and health disparities. He is a founding member of the National Board of Public Health Examiners and the national board of Physicians for a National Health Program. His medical degree is from the University of Pennsylvania; his MPH is from the Johns Hopkins School of Hygiene and Public Health, and he has an honorary Doctorate in Medical Sciences from Drexel University. Dr. Judy Albert is a reproductive endocrinologist and medical director at Reproductive Health Specialists. She is also clinical assistant professor at the University of Pittsburgh and a leader of Physicians for a National Health Program’s Pittsburgh chapter. Dr. Albert received her medical degree from the University of Cincinnati College of Medicine, completed her residency training in OB/GYN at Magee-Womens Hospital, University of Pittsburgh Medical Center and her fellowship training in reproductive endocrinology and infertility (REI) at the Hospital of the University of Pennsylvania. 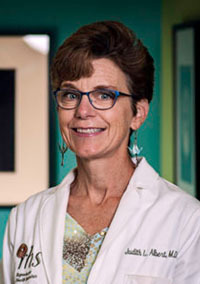 Dr. Albert’s experience includes practicing and teaching at the Hospital of the University of Pennsylvania and at the University of Pittsburgh Medical Center’s Magee-Womens Hospital, where she served as medical director of the in vitro fertilization program and as a medical executive committee member). She is currently involved in several research projects investigating patient fertility evaluation. In addition to membership with the American Society of Reproductive Medicine (ASRM) and the American College of Obstetrics and Gynecology, Dr. Albert is a member of the Society of Assisted Reproductive Technologies (SART) validation committee. She holds current board certifications in both OB/GYN and REI. Dr. Albert and several other physicians chartered the new Pittsburgh chapter of PNHP in 2017 and also attended the PNHP Leadership Training Institute in Atlanta in the same year. She participated in numerous forums and presentations in 2018. Dr. Lachman graduated from Antioch College with a BA in Philosophy in 1963. After attending the University of Pennsylvania, School of Medicine from 1963 to 1967, he interned at Pennsylvania Hospital. He was selected for the US Public Health Service, and was stationed for two years on the Turtle Mountain Indian Reservation in North Dakota. He was a neurology resident at the Cleveland Metropolitan General Hospital from 1970 until 1973 and a fellow in clinical neurophysiology at the Mass General Hospital from 1973 until 1975. In 1975, he joined a private practice in the Philadelphia area. He joined the neurology faculty at Hahnemann University from 1978 to 1982, when he returned to solo private practice at Lankenau Hospital. In December, 2006 he became a full-time faculty member in the Department of Neurology at Temple University School of Medicine. Dr. Scott Tyson, is the CEO of Pediatrics South. He received his training at Columbia University, and the University of Pittsburgh. Dr. Tyson completed his residency at Bellevue/Upstate and is board qualified. William R. Davidson, Jr., M.D. Dr. Davidson is a board certified Cardiologist who has been practicing in central Pennsylvania for nearly 30 years. After 8 years of undergraduate and medical training at the University of Virginia, he completed an Internship and Medical Residency in Baltimore. Prior to his Fellowship in Cardiology at the Hershey Medical Center, Dr. Davidson spent 3 years doing “whatever was needed” at a general hospital in rural Tanzania. The immediate past-president of the Good Samaritan Hospital, Dr. Davidson spends a lot of his spare time writing newspaper articles and giving lectures promoting Single-Payer healthcare reform. Pennsylvania AFL-CIO, State Convention, April 6, 2006. How can we afford not to adopt single payer?